The Brandcusi system is a modern take on traditional banner stands. 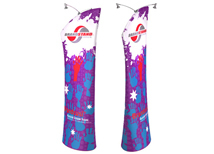 They are designed similar to the Waveline system using a tubular aluminum frame and a stretch fabric graphic to create an eye catching, yet portable display. 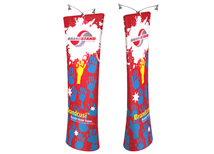 Every system includes DOUBLE SIDED graphics so it can be used as banner stand or as an isle display. We offer optional shelves and lights to make the Brandcusi even more practical. Lead time is only 5 business days making this modern system attainable even in a time crunch! 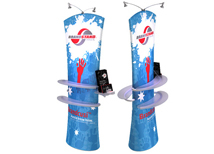 The Brandcusi banner stand is a great addition to any display booth. Its extremely easy to assemble, yet very lightweight and easy to transport. A molded case is included in every kit which protects it in transit. The double sided graphics make the Brandcusi great for events, trade shows, and fairs because it can be seen at any angle! We offer curved, straight, and angled styles to fit any marketing theme! The optional shelves for the Brandcusi add another practical element to this system. 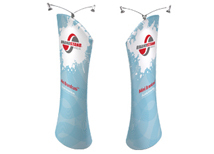 It can be used as a product display, literature holder, greeting station, or informational kiosk! Optional lighting will help illuminate the graphic or items displayed on the shelves. Everything packs into the padded case and can be transported anywhere in the world!